Each week the award will be allocated to those who show ability that favours the core components it takes to become an AFL Player. To be eligible to be nominated for the award, a player must be born in 2000 or younger. 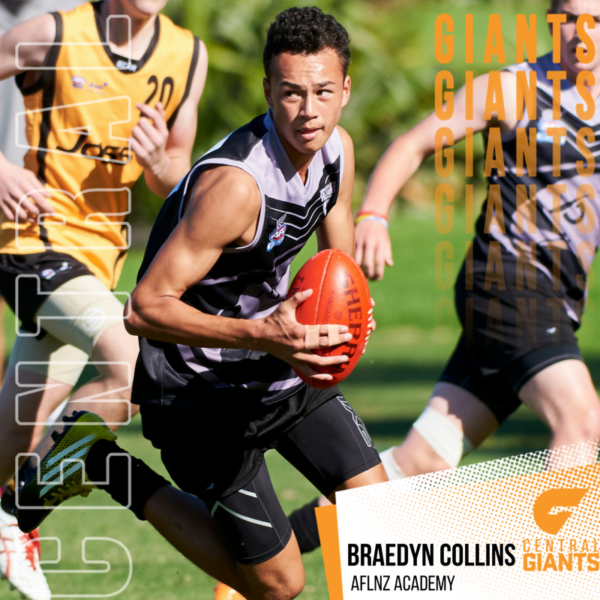 The AFL New Zealand Rising Star award for round 7 of the 2018 AFL New Zealand Premiership has been awarded to Braedyn Collins from the Central Giants. The 17 year old from Auckland’s North Shore has been one of the most consistent players in the 2018 AFL New Zealand Premiership. Full of talent, Braedyn has all the attributes to make it in the game of AFL with height, speed and skill execution. “Braedyn is a great athlete who has come back to AFL after focusing on representative Rugby. Constantly developing his understanding each game and able to apply with his physical attributes Braedyn will be an athlete to watch in the future.” National Youth Manager, Mick Coultard. AFL New Zealand Media had a chat with Braedyn during the week. I attend to Rosmini College in Auckland. What kind of sports did you play growing up? How did you get into AFL? I became involved through my Father who thought it would be a good idea to take up the sport for my development. What do you enjoy about playing AFL? I enjoy the game in general as it help me keep active and it’s alot of fun. What are your goals for AFL in the future? My goals for AFL would be to continuing to keep enjoying myself and see where it takes me. What do you think your biggest advantage is out on the field? On the field I think my advantage is my speed and fitness and I also have a big vertical leap so am able to rise above the other players in the contest.